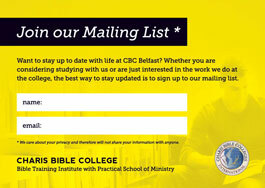 Part of a worldwide network of colleges, Charis Bible College Belfast is a Biblical Training Institute with a Practical School of Ministry. 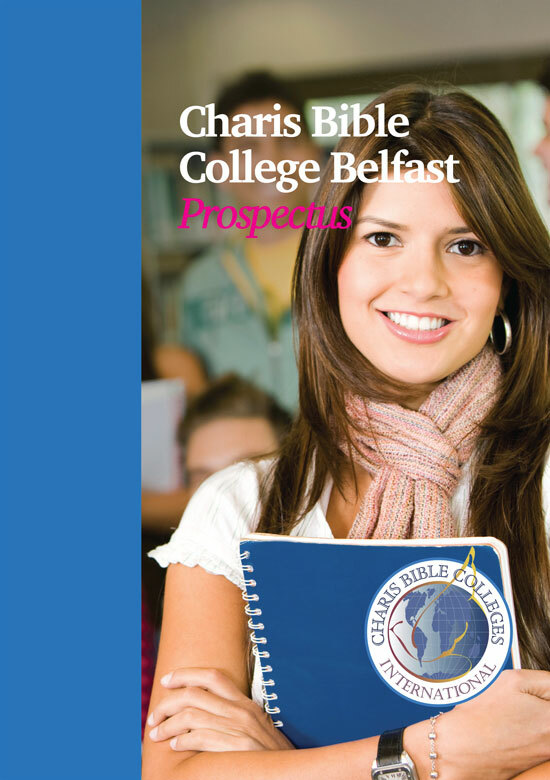 As a relatively young college in Belfast, Charis came to us for help with promoting their courses in a way that would bring them in line with other more established colleges in the city. 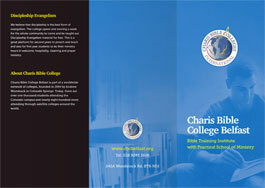 We designed a colourful and fresh A5 prospectus which appeals to the demographic of students Charis attracts, while explaining the College's history, purposes and resources in a clear and professional manner. 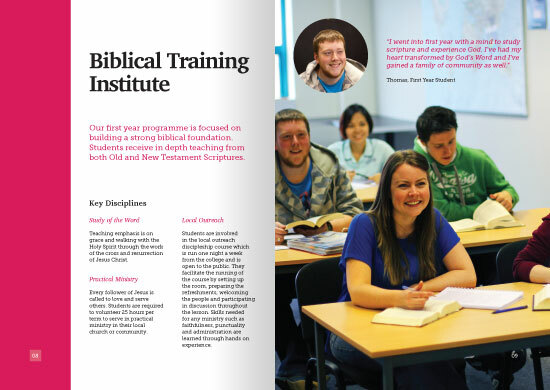 Each section of the prospectus is colour-coded with vibrant hues, supported by strong imagery. While some stock photos were necessary, we were very keen to use real life shots wherever possible of the students in class, learning how to minister and enjoying college life. Students were also encouraged to participate by providing their own personal experiences of attending the college and studying in Belfast. 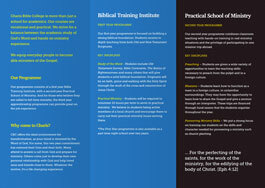 To support the prospectus, A4 trifold brochures were produced. These "mini-prospectuses" provide a quick introduction to the college for prospective students and supporters. 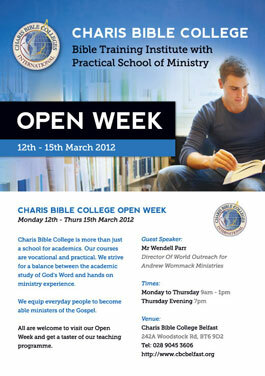 A number of A6 postcards and A1 Posters have also been created to promote specific events at the college. “SOLID are professional and driven by excellence. They have made what seemed to be an impossible task enjoyable. The new college prospectus is a great read and page by page you engage in the mission statement of the college while still focusing on the academic side. All content and imagery including design and code copyright © SOLID 2015. No work can be reproduced without prior consent.